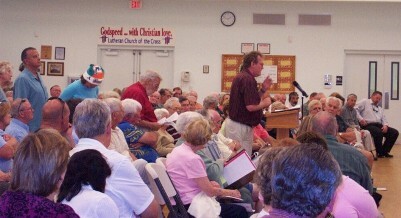 Nearly 300 owners attended the CCFJ Town Hall Meeting on Saturday, December 6, 2008 in Punta Gorda in the meeting hall of the Lutheran Church of the Cross. 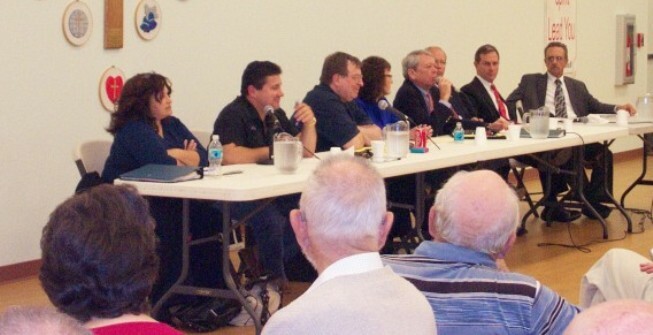 Even locals were surprised that so many interested citizens attended the meeting. From Left: Attorney Barbara Stage, State Rep. Julio Robaina, CCFJ President Jan Bergemann, CCFJ Area Rep. Kim Jakubaitis, Mark Benson (Member of RCCAM), State Rep. Ken Roberson, State Rep. Paige Kreegel, County Commissioner Bob Starr. It is very obvious that the bad economy clearly highlights the downfall of the association system. Instead of protecting property values -- as promised to interested buyers -- these associations turn more and more into a financial liability for financially responsible homeowners. Representative Julio Robaina made it very clear that the legislators are keenly aware of the financial problems caused by many foreclosures in these associations. Robaina promised that a bill will be proposed ASAP -- maybe even in a special session called regarding the Florida budget shortfall -- that will deal with serious improvement in Florida's foreclosure laws for homeowners' and condo owners' associations. A lengthy discussion covered the problem of protecting association funds against embezzlement and other criminal mischief. The sad example of the Charlotte Square Condominiums showed that a lot more needs to be done to protect the owners' money and to prosecute the criminals. It is not reasonable to expect that the owners who have already suffered serious financial losses would be required to pay a special assessment to find out where their money went, how much money actually "disappeared" and to pay for legal representation to recover minimum part of their money. Where is the accountability of the management company that the owners trusted with their money? A management company that isn't able to protect the money it was in charge of shouldn't be allowed to stay in business. More CAM regulation -- and stricter enforcement -- is needed! In regards to many questions from the audience Mark Benson explained that as of January 1, 2009 Community Association Management firms are to be licensed. That goes as well for developers who provide management services. With the changes to 468 F.S. CAM s accept the responsibility to provide guidance and direction to an association and indemnify the client association from liability if they do not provide the proper advice. all homeowners don’t have the money to fight for their rights. The majority of complaints were exactly the same we heard all over the State of Florida , clearly contradicting the claim of special interests that real problems in associations only exist in the Tri-County area of South Florida . The dysfunctional DBPR was again target of many complaints of the citizens. A few speakers claimed it to be the most useless Florida government agency. The citizens’ complaints didn’t agree with the new DBPR Secretary Chuck Drago’s claim in his latest newsletter that attendees of his "On the Road to Better Business" tour had great things to say about the people who work for the DBPR. Quote: "It takes great people to affect change, and we’re fortunate to have a wonderful team." Another DBPR Secretary running around with blinders who doesn't want to listen to the facts? Tallahassee must have an unlimited supply of bureaucrats who have hearing problems! be useless. Florida 's owners living in associations need protection. A large majority of the attendees -- by show of hands -- was in favor of a regulatory agency for homeowners' associations and are willing to pay for it! Representative Julio Robaina made sure that this question was answered by the people in attendance, because special interests often accuse him of trying to micromanage Florida 's associations -- against the will of the people living in these associations. For financial reasons, special interest service providers and certain board members may be against regulation, but the citizens definitely are not! CCFJ Area Representative Kim Jakubaitis made it very clear what owners hope to see accomplished in the next legislative session (quote): "We expect the Florida legislature to safeguard our largest investment, our homes. Defend our rights as homeowners, by enacting laws that shield us from the abuses, financial and otherwise, that we currently have no protection against." All three Florida legislators present promised their strong support for upcoming HOA Reforms to be sponsored by Representative Julio Robaina. Representative Paige Kreegel remarked that after hearing the presentations today he wants to work closely with Representative Julio Robaina to achieve HOA Reform legislation. Representative Ken Roberson even went a step further when he promised Representative Julio Robaina that he will definitely "Co-sponsor the HOA Reform Bill." In his closing remarks State Representative Julio Robaina promised homeowners that"HELP IS ON THE WAY!" He will work very hard to accomplish the goals discussed in the town hall meetings and the proposals made in the CCFJ HOA REFORM SURVEY. "It is really important to protect the welfare of Florida's families living in associations. A HOA reform bill is being written and will be proposed to the Florida legislature!" As much as we heard positive things in regard to upcoming reforms, we owners have to be vigilant and make sure that our voices are heard all the way to Tallahassee . All the owners who want the help of our legislators to create the necessary laws should never forget: These legislators need our help and support to convince their colleagues that reforms are needed. Help these legislators so that they can help us!